Your bedroom is your sanctuary, a place that entirely belongs to you. It is a place where you rest, chill out and think in peace. If the look and layout of your current bedroom give you negative feelings rather than positive then it’s time for a change. Whatever the reason is that you want a change, it’s important that you become to love entering and being in your private place. Here are 4 bedroom remodel ideas to incorporate into your home to make your bedroom a place to cherish. An open layout and spacious bedroom is something that is delightful to have at your disposal. By removing a wall or two and changing the layout, you create a more comfortable environment to live in. It gives you the privilege to do private workouts and any other tasks and activities that require a reasonably sized space. An open space won’t make it feel like you’re caught in a confined space. Lighting makes all the difference in a room. New and cool lighting can totally transform the look and feel of a bedroom. If your space is feeling a little dull or lacks vibrancy, there are so many lighting options and styles you can implement to create a cool, unique look and environment. You could add a dimmer to easily change the brightness of your lighting. You could add string lighting, chandeliers, neon lights and so many more different lighting options to make your bedroom space fun, funky and unique. Including different light sources (general overhead lighting, specific lighting and some decorative lighting) is the best choice. Cool new gadgets and helpful technology are everywhere. There’s a big need for tech gadgets in the bedroom. Wouldn’t it be great to not get up and physically shut your blinds?. Well, there is a gadget that will do that for you. Gadgets exist for all kinds of tasks and problems like controlling the lights, working the television and even tracking your sleep. 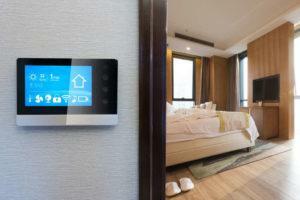 A smart bedroom will make your life. Foldable furniture takes up minimal space so there is a lot more empty space to place your favourite decorative items in order to suit you. Foldable pieces can be easily folded without any extra effort and are simple to move from one place to another. There are many folding furniture options you can put in your bedroom from beds and sofas to tables and chairs and lots more. Your room will never look cramped and messy with foldable furniture. If you’re thinking of remodelling your bedroom as part of a home renovation then Sigma Homes are the perfect partners to get the job done. Book your consultation with us today by visiting us online or by calling us on 021-436-5866.